I'm new here. Just joined today after finishing Oathbringer and dieying over and over again from not having people around who read it. Anyways I just started getting into Branden Sandersons book after I read the Mistborn trilogy. I started steelheart still reading it *badum tiss* .Meanwhile I found the stormlight archive. The rest is a blur. Anyways I shipped Shallan with almost everyone thought the while series. Until Adolin and Kaladin. So I was okay as long as something was sailing. Welcome @Shalanshipper! 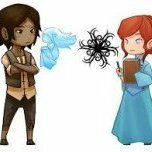 What's the best ship name you've come up with for Sanderson characters? Welcome and have an upvote!! We like to greet others by saying "my life to yours, my breath become yours" you should try it! you tell me first. Join the club young Radiant! I've been spreading Brandon Sanderson to everyone IRL but none of them are up to date with everything so I came here too. I did shaka her with kaladin and shado for adolin.